WHY MANAGED SECURITY SERVICES PROTECTS? Surprises are great for birthday parties. Not I.T. costs. 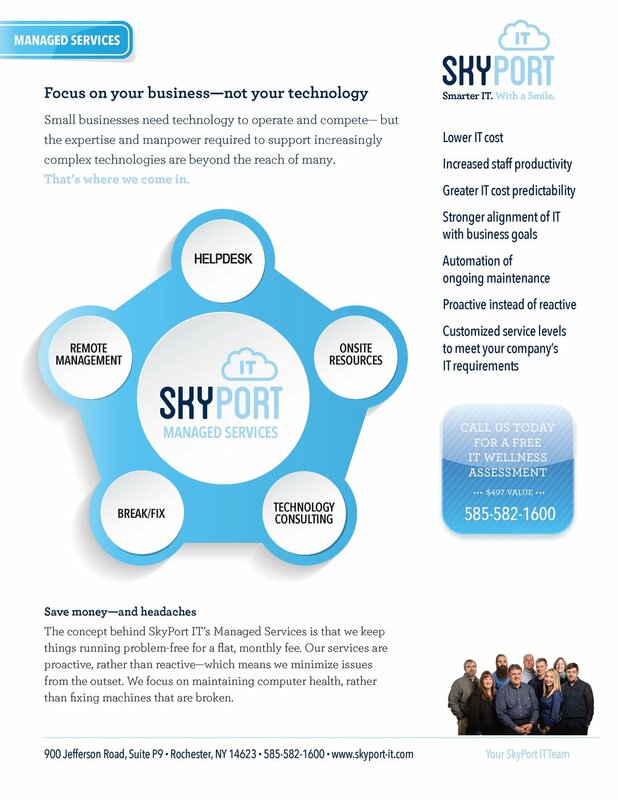 The concept behind SkyPort IT’s Fortified Data Security Services is that we keep your data safe and problem-free for a flat, monthly fee. And, we seek to minimize issues from the outset, which means everyone wins. Our services are proactive, rather than reactive. The model works because IT issues are prevented before they become problems. We charge a regular monthly fee to maintain computer health, rather than an hourly fee to fix machines that are broken, and therefore your costs are reduced because your network is always healthy and strong. The cost of IT is lowered through a regular monthly fee that covers all preventive maintenance fees. We monitor a number of key network health indicators, like update patches, anti-virus, and anti-spyware tools; and we make upgrades and provide fixes before users are impacted or notice a decline in performance. When an issue comes up, we have a best-in-class remote-management and ticket-tracking system that you can access 24/7. With unlimited Helpdesk support included as part of our support services, most network issues that users do experience are problems that can be corrected immediately. without an office visit or hourly fee. Our clients have access to our Solutions Engineers, individuals who have worked with other small- to medium-sized organizations to ensure that IT furthers company strategy. Through quarterly business reviews, we examine client business goals and provide advice and support based on both available and future technology. Ultimately, we find ways to make our clients’ networks not only stronger but also more efficient. Windows, Office, Adobe, Java, and Hundreds More.